As we’ve talked about previously, Quest has been fortunate enough to be able to collaborate with Growing Chefs, an amazing not-for-profit aimed at educating children on gardening, cooking, and healthy eating. The partnership between our two organizations seemed to be a natural fit. On October 13th, 2011, we invited our food vendor and social service agency partners, as well as other stakeholders in the community, to our 2020 Dundas location for our annual Partnership Appreciation event. Last year, we held an Iron Chef competition, but this year, we went with a little bit of a different approach. For this year’s event, we added an educational component with the help of Growing Chefs. 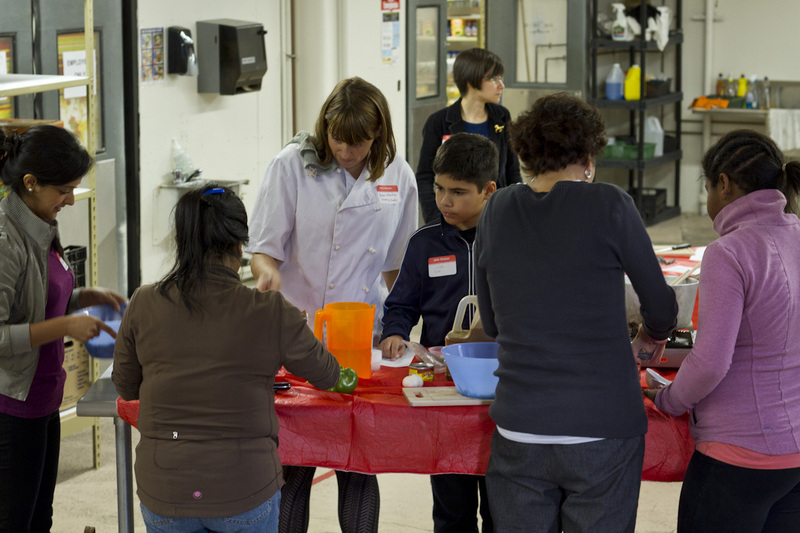 We invited several families who shop at Quest to participate in a workshop on shopping for and cooking with healthy ingredients. Executive Director of Growing Chefs Helen Stortini and her volunteer chefs developed three recipes for this demonstration, based on food we typically stock in our grocery markets. A dietitian from At the Table Nutrition, Colleen McGuire, provided an in-depth nutritional analysis for each of the recipes. After the participants took a tour of our grocery market with the chefs and dietitian, the workshop was ready to begin. We had set up three stations in our downstairs space; each chef (Helen, Alexander, and Tanya) was designated to a station. Armed with a hot plate and some other basic utensils, the chefs and the families whipped up a salad, a vegetarian entrée, and a dessert option, using local and organic ingredients where possible. Once they were finished, they trooped upstairs to where the other guests were mingling and presented their creations to the crowd. The families were asked about their favourite parts of the workshops. One of the participants, Carlos, age 10, had never tried vegetarian chili before, and loved the version the chefs made that day. Other features of the event were a video about Quest, and speeches by some of our partners who continue to be very involved with our organization. Speakers included Sue Ross from YVR Airport Authority, Chris Porte from Youth Spot Employment Centre, Jean Robertson from Natural Factors, and Gord Alteman, Vice-President of Quest’s Board of Directors. We had nothing but positive feedback on the event from both workshop participants and stakeholders. We’d like to thank our event planner, Kristy Masaro, for her help in organizing the logistics of the event, and Bread Garden Catering for providing the delicious hor d’oeuvres. We hope to provide more workshops such as this in the near future, with the continued assistance and guidance of Growing Chefs. Check out this video made by our Marketing interns, John-Michael Parra and Julie Petrynko. It includes interviews with agency partners, vendors, financial sponsors, and clients. Let us know what you think! A few weeks ago, I was asked by Dennis, a lecturer at UBC, to explain to his class a bit about what Quest does. I was honoured to be invited into their classroom. All of his students are part of the Global Academic Internship Program (GAIP) at UBC and are fairly new to Canada. This meant that they were also unfamiliar with some of the social issues that face Canadians. My challenge was to get across the importance of food security and poverty reduction initiatives, specifically in Vancouver. I couldn’t have asked for a more attentive and engaged group of students. It was nice to see a group of people so inquisitive about the culture and issues of their new country. We even brainstormed ideas in which the students could help fundraise for Quest. We threw around ideas of food drives and monetary donation matching. I was just glad to have piqued their interest on social issues in Canada and perhaps make them think twice about food waste. This week, I was invited back to the GAIP classroom. The 16 students (pictured above) had raised $125 out of their own pockets, which was then matched by Dennis and Jennifer, Senior Program Leader at UBC, for a grand total of $250! I was so happy to receive the donation on behalf of Quest and so proud of them for taking the time to do this. Their donation will likely go toward paying for our new wheelchair ramp (pictured at right) at the Dundas location. This will facilitate access to our grocery market for our clients who have trouble with their mobility. Thank you so much to Dennis and the students for their kind donation and for inviting me in to speak! Word has been circulating on the streets. We’ve mentioned it on Twitter. Someone let the cat out of the bag on Facebook. For months, we have been strategizing and executing tiny details. Just last week, our 346 E. Hastings location shut its doors and, at long last, we opened at 611 E. Hastings, a mere three blocks from our previous location. Our new store is part of the retail space in the freshly-built Union Gospel Mission building, located at Hastings and Princess. We are excited for the opportunity to be so closely situated to a venerable institution in the Downtown Eastside. Quest staff and volunteers were working diligently to stock shelves up until a few minutes before opening this morning. The feeling in the air was one of anticipation. A few minutes after nine, the front doors were unlocked. As they streamed in and shopped around, customers commented on how bright and open the new space is. Natural light streams in over the produce tables and an orange feature wall lends a mood-lifting splash of colour. The store is already bustling! Moving is an extremely arduous process, as we learned firsthand. Now that we’re (mostly) settled, we’d like to thank everyone who helped us during this time. Whether it was a large or small contribution, we could not have done it without you! Let us know your thoughts on the new store if you get a chance to stop by. Edit: the new space is wheelchair accessible! We are still working on getting a push button for the door, although it is usually open anyway. The folks at Vancouver Farmers Markets offer a great initiative for community organizations whose mandates pertain to food systems: Community Tables. These tables are booths just like the other vendors have, but no food is for sale. In true Farmers Market tradition though, there are still conversations started and information shared. Quest Food Exchange will have educational outreach booths at four markets this summer. I worked the first Community Table at Trout Lake on June 11th. The Trout Lake location sees up to 5,000 people each Saturday! Everyone I spoke to (a fraction of the 5,000) was very interested in what Quest does and many wanted to know how they could help. I was happy to have these intrigued minds willing to listen to me wax poetic about Quest. I personally enjoyed this opportunity to interact with people at the Farmers Market. I find that those shopping at the markets are generally inclined to care about food security, whether or not they know much about it at first. There is always the continued struggle regarding ways to engage those who are not interested in food security. I believe it is important to talk to as many people as possible, and hope that they spread the word to friends who have yet to learn about how relevant this topic really is. This outreach is not necessarily about Quest, but about being a part of the community. My goal is to make people think twice about their relationship with the food they eat. The more people who are informed, the better chance we have to make changes to our current food system. If you can make it down to one of these markets, be sure to say hello. I’d love to meet you!